Going for a ride on your motorcycle requires special attention to safety and extra awareness of your surroundings. The 3.5" motorcycle rear view camera System acts as the eyes behind your head to show you everything behind you. The motorcycle rear view camera that is included in this system is typically placed on the bumper of your bike, but can also be placed higher for those who prefer a bird’s eye view. The 170° viewable angle is perfect for the wide area behind a motorcycle that is important to monitor. Standard grade night vision, color imaging, and the ability to hold up in torrential rains are other key features of this camera that make it an ideal addition to the motorcycle. Find the angle that suits you best. Included brackets allow users to angle the camera up or down to fit their specific needs. 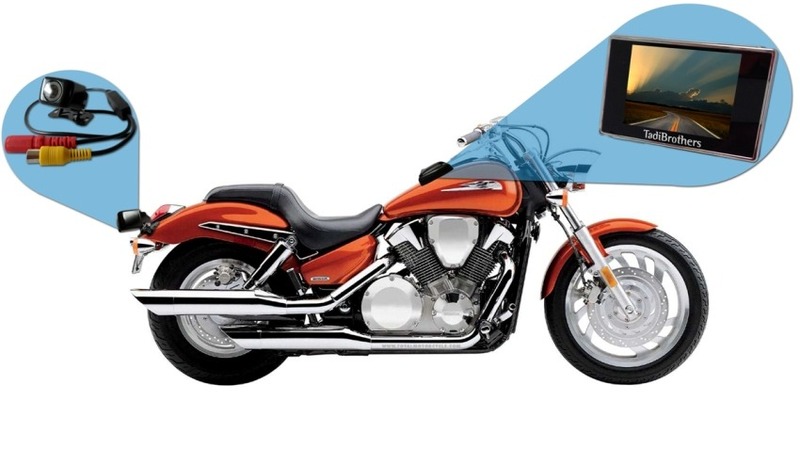 The motorcycle rear view camera System also comes with a perfect size 3.5” color monitor that stays securely on your motorcycle with industrial grade velcro. Remove the monitor quickly at any time! Rave reviews from our customers state that the picture delivered by the combo monitor and camera is as clear as it can possibly get. Customers also state how delighted they were with our friendly customer service department and ease in installing the system. Don’t let the small screen size fool you - 3.5” is the ideal size for those looking for a quality camera that is easy to see, yet doesn’t take up a great deal of room. Shop Tadi Brothers today for your backup camera needs.